By 18-24 months, babies have become toddlers. They spend their time exploring and testing the world around them. They test everything—words, strength, gravity, your patience, power, control limits, etc. They want to be a part of the daily routine, so it's a good time to introduce simple practical life activities focusing on personal and home care. Toys for toddlers should hold up to rigorous throwing, dropping, crushing, banging, and pulling. For safety reasons, avoid heavy toys for this age group including items that could be thrown, and things the child could tip over on top of herself. Avoid electronic toys that do more to entertain and distract a child than to encourage play. Electronics offer no benefit to this age group that needs to experiment with simple, concrete objects. This page contains affiliate links, which help make it possible to bring you this Montessori gift guide. If you purchase an item through one of the links below, we might earn a small commission for referring you, but it won't cost you any extra. These large wood puzzles are perfect for young toddlers. The larger rounded knob encourages a strong fingertip grip (writing muscles), and with only three shapes to choose from, it's possible to complete the whole puzzle before losing interest or getting frustrated. These thicker domino cards offer an opportunity to match by shape, color, and number. Use just a handful of these as a matching activity to start, or play a simple domino game with the whole family. Once a toddler has mastered walking on their own, it's time to add a bit more complexity. Steering and balancing this push duck toy is a welcome challenge for this age. The wood stick is more manageable than string pull toys, and more challenging than the walker wagon we suggested for 6-12 month olds. This is a classic Montessori material designed to build fine-motor and coordination skills. The smaller size of the dowel and discs encourages the tripod finger grip later used in writing, but are still large enough to avoid choking hazards. The simple colors and design help your children focus and make connections faster. Dolls aren't just for girls. This handmade Waldorf-style doll is perfect for any 18-24 month old, and will stand up to strong love and use for years. A doll is perfect for caring role play, learning body parts and gentle, kind touch, and general companionship. Here's an active activity your child can do indoor or out! We prefer softer pins for this age to help with noise and for safety reasons. This is our favorite first knife. It's a real tool and can cut most foods, but is blunt to the touch and won't easily cut a child's fingers. Make sure you get a smaller cutting board too! Real silverware and real plates demonstrate trust, encourage care and responsibility, and offer children a sense of prideful ownership. This toddler-sized set of utensils are from For Small Hands, and feature blunt tines and a slightly smaller size than their child utensil set. Yes, these are glass, and yes you can expect your child to break something. Offering real glassware to your child demonstrates trust and encourages care and responsibility. When your child breaks one of HER glasses, it will have a bigger impact than you saying "be careful!" ever will. I like this glass set from Duralex for this age because it is truly durable and quite forgiving. They have a handful of other styles if this one doesn't suit your taste. This smaller set from Oxo is our favorite first dustpan and brush. 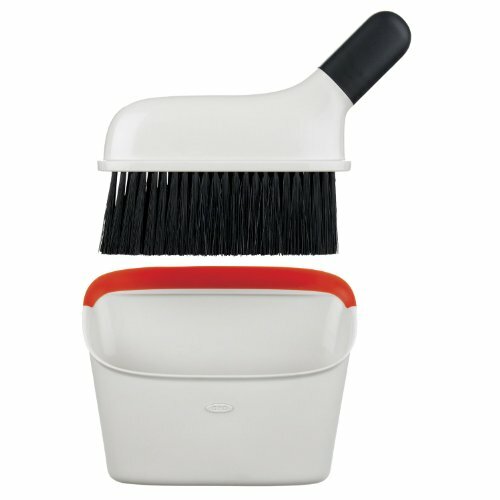 The bucket style dustpan helps keep dirt in place all the way to the trash can, and the side handle on the brush is easier for toddlers' hands. This washable place mat from Handmade Montessori offers a clear model of exactly how to set your place without any adult intervention. These are used in the Montessori Young Child communities to offer independence and teach place-setting. Use this place mat with child-sized utensils and tableware to help your child learn this same skill. There are lots of places to buy a child-sized apron now, but finding one that a toddler can independently use is still a challenge. This is our favorite design; a full front and half-back secured by elastic on the sides. Easy to pull over your own head, and no snaps, ties, buttons, to strings to get in the way. This apron from Handmade Montessori has the bonus of vinyl-coated cotton fabric which makes it easy to wipe clean. A child sized backpack with pockets for treasures is a must for daily walks. This one is from Herschel and at 10 inches square, it should fit many 18-24 month olds. The magnetic closures and one zippered pouch are manageable skills to master but any smaller backpack with a zipper, Velcro, or fold over flap would work for this age. We recommend a smaller pocket on the back or side, and a pocket for a water bottle is always welcome. Chalk is another winner for 18-24 month olds. This triangular chalk encourages a tripod pencil grip AND it won't roll away. I stick with 2-3 pieces of chalk at this age, any more and a child will just spend her time switching chalk instead of drawing. This three piece garden hand tool set is perfectly sized for small hands, AND they actually work. Start with the green rectangular trowel for scooping soil, and over time your child can help rake and dig too. Sturdy legs means longer walks and the need for snacks. This snack pouch is from Zerlina Crafts, and is washable, water-resistant, and has a flat bottom to stand up on its own. Plus, the little tab on the side is perfect for clipping to a backpack for easy access. This is a good introduction to the world of wheeled toys, and learning how to steer. This trike is difficult to tip over and is low enough to the ground for most 18 month olds to climb on by themselves. Painting with water is a great outdoor activity for young toddlers. Endless fun, no clean-up, and you can paint almost anything. We suggest using the larger paintbrush in this set for outdoor, and save the others for indoor art projects. This bucket from Toysmith is made from metal and holds up well to repeated outdoor use. Help support this resource by using the direct links from this page to purchase gifts. We use "affiliate links," which allow a retailer to track who referred a customer to them. If you decide to buy something based on our recommendation, we may earn a small commission for referring you. Amazon requires the following disclaimer: "montessorigifts.com is a participant in the Amazon Services LLC Associates Program, an affiliate advertising program designed to provide a means for sites to earn advertising fees by advertising and linking to amazon.com."